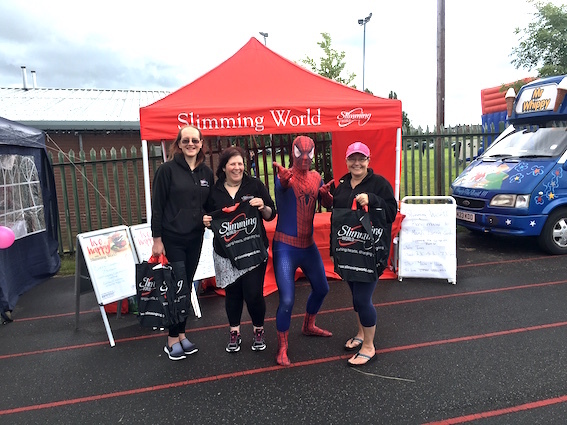 Despite the wind and showers, we had a fabulous day at Belle Isle gala on Saturday 3 July 2016 promoting all the local Slimming World groups of South Leeds, particularly our new Wednesday 7.30pm group at Belle Isle WMC. Even Spider-Man got in on the act! A massive thank you to the gala committee at BITMO for organising and being so helpful on the day. The gala is always a great way of reaching the community to promote easy, family friendly, healthy eating and we appreciate the opportunity to be involved each year. This post was written by Vicky Sampson using our Create an article for South Leeds Life page. PREVIOUS POST Previous post: Beeston is Swishing! Well done Vicky Sampson. Hope to see more posts by you.